Prototype: German Federal Railroad (DB) TVT (later class 701) maintenance vehicle. Movable work platform and double arm pantograph included. Used for servicing and checking catenary. The unit looks as it did after being delivered after 1957. Full array of function features with up to 32 functions. Digital decoder and extensive sound functions included. Work platform and pantograph can be controlled digitally. Model: The unit has a digital decoder and extensive sound functions. It also has controlled, high-efficiency propulsion. The unit has a compact-design, maintenance-free motor. 2 axles powered. No traction tires. The triple headlights and dual red marker lights change over with the direction of travel, will work in conventional operation, and can be controlled digitally. The unit has the double "A" light function. Maintenance-free warm white and red LEDs are used for the lighting. The engineer's cab has interior details. The work platform can be raised, lowered, and turned in digital operation. The double arm pantograph can be raised and lowered in digital operation. The pantograph does not pick up power from the catenary. Separately applied details are: skylight window, horn, floodlights, and ladders. Length over the buffers 16.0 cm / 6-5/16". 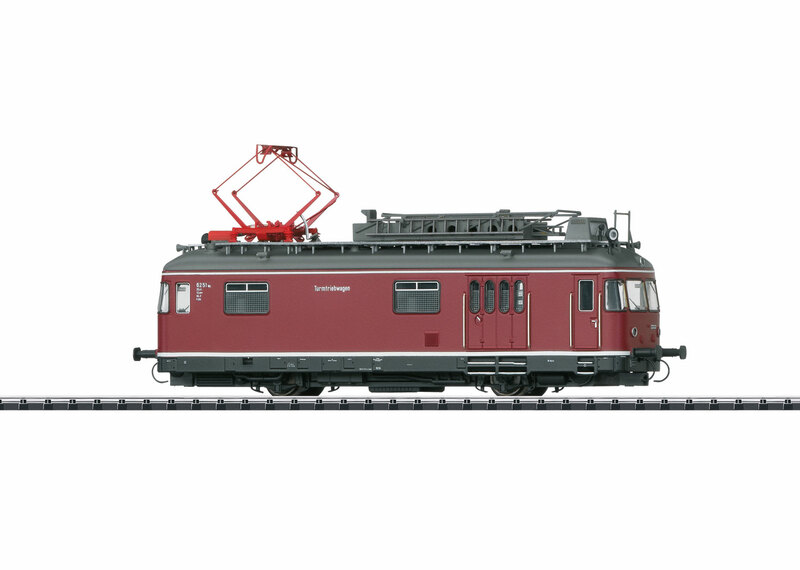 This model can be found in an AC version in the Märklin H0 assortment under item number 39974. Trix 22974 / Märklin 39974 – Class 701 Powered Catenary Maintenance Rail Car With advancing electrification, powered catenary maintenance rail cars for maintenance work on the electrified route network took on increasing importance on the new German Federal Railroad. Starting in 1954, the firm Waggon- und Maschinenbau GmbH in Donauwörth (WMD) working in a contract and in close cooperation with the German Federal Railroad‘s central office in Munich therefore developed the so-called standard powered catenary maintenance rail car (TVT, also VT 55 or VT 93, from 1968 on: 701). These units made wide use of design elements of the two-motor VT 98 rail busses. Since there was no question of electrical propulsion, combustion motors were selected as a source of propulsion. Two Büssing motors (type U9A) each with a performance of 95.5 kilowatts / 128 horsepower were still sufficient for the running gear on the first production series (701 001-010 and 024). On all of the successor series the two water-cooled motors mounted below the floor (Büssing type U10) with a total performance of 300 horsepower / 221 kilowatts were the same as the motors for the VT 98 (798). A special rpm speed regulator allowed a constant “creeping speed” of 5 km/h / 3 mph. The drive systems mounted in the frame were analogous to the VT 98 and were designed for a trailing load of 40 metric tons. In addition, this powered rail car could be used in switching maneuvers with a total trailing load of 200 metric tons. To do this the unit was equipped with standard drawbar and buffer equipment of a standard lightweight construction. There was a workshop between the two cabs of about 26 square meters / 260 square feet area, where you could climb into the viewing cupola to observe the catenary. In addition, there was a specially protected roof exit as well as a pantograph on the roof for grounding and testing. In the middle of the roof was a platform with almost 6 square meters / 60 square feet of area that could be raised and lowered in height and turned from side to side. It could be raised up to one meter / 39 inches. An extendable ladder was also present on this platform, and it could be used for work up to 15 meters / about 48 feet in height. A speaker system was installed for communication between the cab, the lookout, and the lifting platform. The car also had compressed air disk brakes, cold water heating, and two separate 12 volt power supply systems. By 1974, the DB purchased 162 dual-motored powered catenary maintenance rail cars, which were given the class designation 701 starting in 1968. Originally, all of the powered catenary maintenance rail cars had a crimson paint scheme (RAL 3004). Starting in 1975, they were successively repainted in the customary “Gold Yellow” (RAL 1004) as part of major maintenance for DB maintenance units. Starting in 2002, a lack of spare parts and the advanced age of the units led to many being retired, which was completed in 2013 with the last powered catenary maintenance rail car being put into storage. Numerous class 701 units were sold to private railroad companies and museum railroads. They are thus now and then still in use for everyone to admire.